North Ridgeville, Ohio – Complete System Solutions, Inc. is pleased to announce the release of Spoiler Alert Food Safety 1.5.1, an update to their popular mobile application. 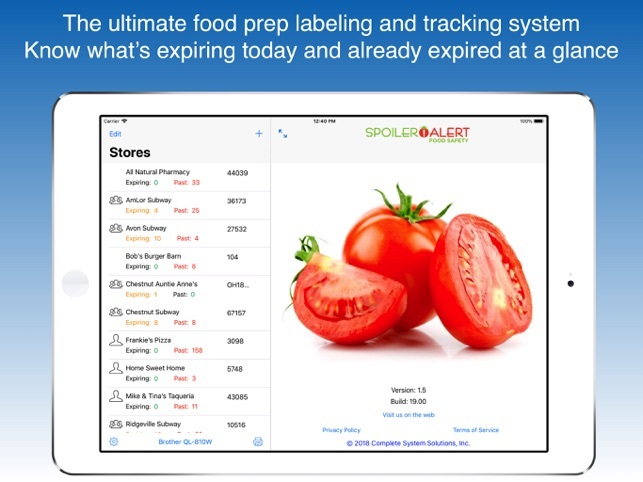 Spoiler Alert was specifically designed to change the way the food service industry labels, tracks and monitors the age of food product from fresh to finished. Easily configured for your products, built-in alerts take the guesswork out of what stage your product is in allowing owners and managers to monitor, even over multiple locations. Complete System Solutions, Inc. (CSS) has been developing software for over 25 years. Starting with large minicomputer systems used by major corporations. Since the introduction of iOS, CSS has been using that knowledge and applying it to iOS development. At CSS we specialize in seeing a need and making a solution to handle that need. All Material and Software (C) Copyright 2018 Complete System Solutions, Inc. All Rights Reserved. Apple, the Apple logo, iPhone, iPod and iPad are registered trademarks of Apple Inc. in the U.S. and/or other countries. Other trademarks and registered trademarks may be the property of their respective owners.